Polls About Elections: What Are They Worth? Two weeks away from the general elections in the Netherlands, and a little over three months away from the US elections, we are bombarded with polls. At least one everyday, sometimes more. What do the findings of these polls tell us exactly? The perennial answer that you will hear from a scientist would be: it depends. Some polls are better than others. Jelke Bethlehem from Statistics Netherlands, the agency that collects official statistics in the country, has developed a very handy checklist that allows journalists to assess the value of polls. Unfortunately for you guys across the pond the checklist is in Dutch. So here’s a flow chart that I created with yED based on the checklist. 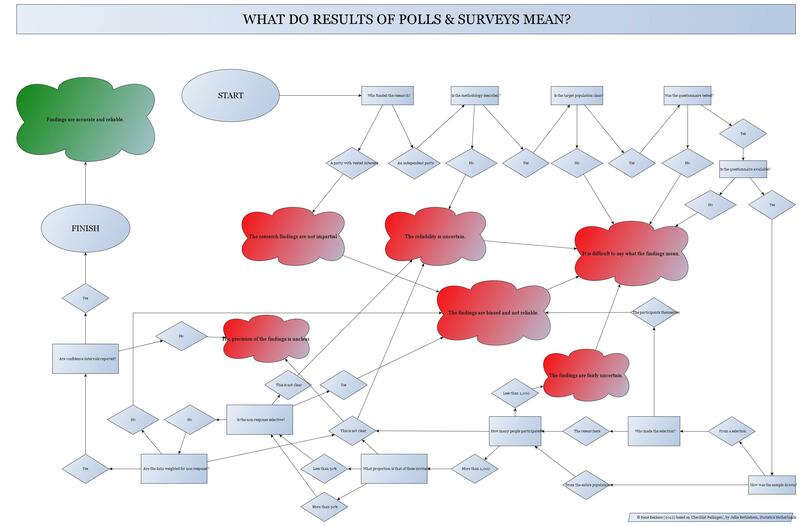 The flow chart helps you interpret the results of polls. You can flow through the chart in this Prezi. My advice: use it every time you find a report about polls based on survey data. You will rarely – if ever – end up at the green fields after the FINISH. The quality of polls depends on so many factors, that the answer to the question “What do the findings of these polls tell us exactly?” for a journalist writing for the general public is: not very much.